The "space ship II" is a further development of the art object that was on view in front of the Pinakothek der Moderne in 2016. It has been created as a floating living space and future architecture in times of global warming and is equipped with everything one needs to live: Living space, vegetable garden and viewing platform - the sun provides the energy. As an exhibition of the Buchheim Museum, this installation floated on Lake Starnberg for three months near the bank in front of the museum and was inhabited by Markus Heinsdorff for several days in August 2018. The low-cost architectural installation demonstrates the possibility to create affordable living space with the simplest of means - all materials are available in DIY stores - which also offers a solution for flood areas. The object floats on two rows of steel barrels (2x8) and has a working area with table and gas stove for cooking on the ground floor. The upper floor is accessed through a hatch with a ladder. The round buildings on both sides of the upper floor are designed as vertical greenhouses with transparent foil and recycled sailcloth. Like the ground floor, the intermediate space with mobile seating and work surface can be used as a living or sleeping area. Weather protection (rain, sun, wind) is provided by removable sheets of sail fabric. The beams that support the upper floor consist of two 40 x 40 mm drywall profiles with an internal triangular plate for bracing. They are height-adjustable with threaded rods and, with a material thickness of 0.6 mm, offer an extremely light and inexpensive construction. The equipment also includes a solar water heating system on the upper floor: black 60l steel barrel, heating by solar energy with feed pipe, manual water pump and a drain. The water can be used for showering or to sanitize drinking water. The solar system consists of 50 W panels, battery and 220 V connection for light and 12 V for water pump with control electronics. The solar system supplies energy for an automatic watering system to sprinkle droplets on the plants of the floating garden. Moisture sensors in the bedding control the amount of water and the supply via hoses. In the two greenhouse chambers (upper floor, left and right round building) there are infusion droppers for seed rearing and seedlings. The infusion droppers are equipped with recycled PET bottles. These are automatically filled with water. 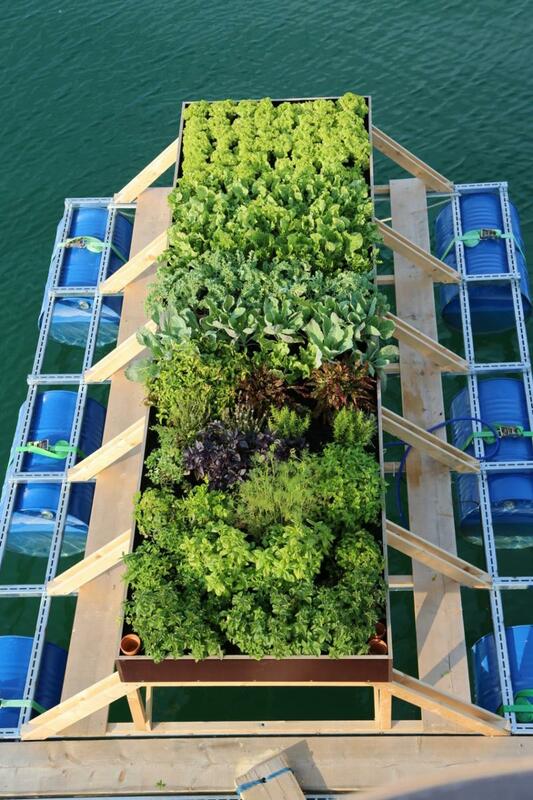 The floating garden consists of six barrels on a steel frame and a plant bed on waterproof wooden panels (4.8 sqm) with electricity and water connection (via solar system). It can be reached via a wooden plank.